The exact fate of Amelia Earhart and Fred Noonan was never determined. What happened to Amelia Earhart has become one of the greatest mysteries in aviation. And few mysteries have ever captured the public imagination so thoroughly. 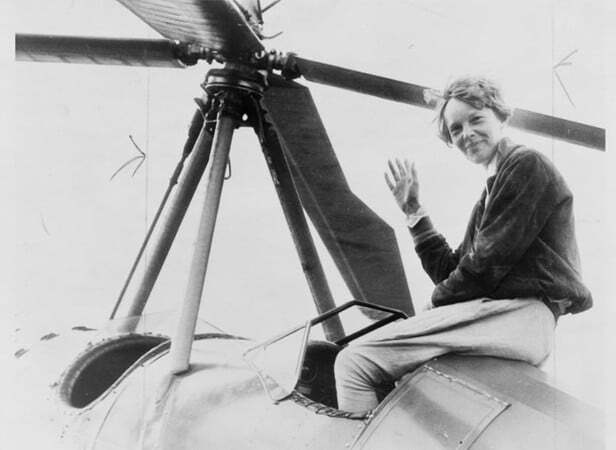 Home » Aviation Articles » History of General Aviation » What Happened to Amelia Earhart? Long after the summer sunset had bled into the horizon, the Electra 10E left the Earth behind and climbed into the sky. The stars that filled the heavens over Lae were bright.Without smog or blinding city lights, the view was clear. Amelia Earhart and her navigator Fred Noonan were not visible for long as they sailed into the dark. As they set off on the last leg of her world flight, the unfamiliar southern constellations guided them into the ether. Without smog or blinding city lights, the view was clear. Amelia Earhart and her navigator Fred Noonan were not visible for long as they sailed into the dark. As they set off on the last leg of her world flight, the unfamiliar southern constellations guided them into the ether. With over a thousand gallons of fuel, they would be able to fly for 20 hours. Their target was Howland Island, over 2500 miles away. Between the two points, there was a vast expanse of uninhabited ocean. Across that vast distance, they would navigate by compass, the stars, and their wits. As they approached their goal, they would follow the radio signal from the Itasca. The U.S. Coast Guard cutter had moved near the island to guide them in. Amelia sent several radio reports to Lae until they were out of range. She sent the last message at 8:00 am. Everything was going to plan; they were flying at 12,000 feet and were on course for Howland Island. It would be almost 12 hours until they were heard from again. This was the final stage of a long trip and it had taken its toll on the crew. Reporters who had seen Amelia in Papua New Guinea wrote that she looked tired and ill. The purely physical strain of the long flight was immense. And Earhart was also under financial pressure. She had risked much of her personal fortune on the round-the-world flight. Her first attempt to circumnavigate the globe had been plagued by mechanical problems. It had ended in failure when her plane had “ground looped” on take off in Hawaii. When she returned to the US, she faced criticism over her flying. She maintained that the accident was due to a faulty landing gear. Her critics (including her former technical advisor) claimed it was due to pilot error. Before she departed for her second attempt, she wrote a letter to her husband. Her choice of words would prove to be more poignant than intended. At 19:30, Amelia made contact with the Itasca. She reported that they were running low on fuel, but they should soon be in sight of the ship. Radio conditions were extremely bad, and Earhart wasn’t able to hear the reply. The Itasca’s signal was drowned out by the commotion of commercial radio traffic. Local radio stations were whipped into a frenzy by the historic flight. For the next 44 minutes, Earhart and the Itasca would struggle to establish a good radio connection. At 20:14, the radio operator became the last person to hear her voice. The Itasca kept trying to contact the plane for over an hour. As they listened to the silence, it became clear that something had gone terribly wrong. They knew the plane must have come down within 100 miles of the coast. But where exactly? There was a huge area of sea to search and very little time. President Roosevelt immediately authorized a full-scale search and rescue operation. Experts believed that the empty fuel tanks would keep the plane afloat for longer. With 9 ships and 66 aircraft joining the search, they hoped to find the plane before it sank. Ultimately, 4000 men would comb 256,000 square miles of ocean. It was one of the largest search operations ever. They would fail. Amelia Earhart was already a household name long before attempting the flight. Her early flying feats had catapulted her onto the world stage. She was also a widely-read writer and public speaker. She was a known to all and an inspiration to millions. Her adventure with flight started early in life. As a child, she built a “roller coaster” on the roof of the family toolshed. In fact, it was little more than a ramp. As she rode her wooden box car along the ramp, she felt like she was flying. A few moments later, she actually was – and then she crashed into the ground. Fortunately, she walked away from the experience with only a few scrapes. Her first contact with a real plane was much less exciting. She was at the Iowa State fair in Des Moines with her father. He had seen a biplane on display and wanted to take her for a closer look. For Amelia, one glance was enough. She saw a rickety old thing, built from rusted wire and wood. She had no interest in such a sorry looking “flivver”. Some years later, a friend took her to an air fair in Toronto. During the show, a WWI ace entertained the crowd with a display of his flying skills. Amelia and her friend were standing apart from the main body of the crowd. They must have made a tempting target from the air. The pilot swooped down to buzz them, hoping they would scatter. Instead, Amelia stood her ground, staring down the plane as it shot overhead. This time, she left with a much more favorable impression. She later said that it was as if the plane had spoken to her. In 1920, she visited an airfield with her father. There she met the appropriately named Frank Hawks, who agreed to give her a ride. As the plane climbed to 200 feet, she realized she had found her true calling. From that moment on, she was determined to fly. On January 3, 1920, she visited Kinner Field to find an instructor. There she met Anita “Neta” Snook, who agreed to teach her everything she knew. The full course of training would cost $1000. She immediately set about saving money for lessons. She had to take on several jobs and her parents to contributed too. She found work as a photographer and took a job as a stenographer for a phone company. She even worked as a truck driver. In October 1922, she set the first of many records when she became the first woman to fly at 14,000 feet. It would take a few more months until she was issued with her pilot’s license. 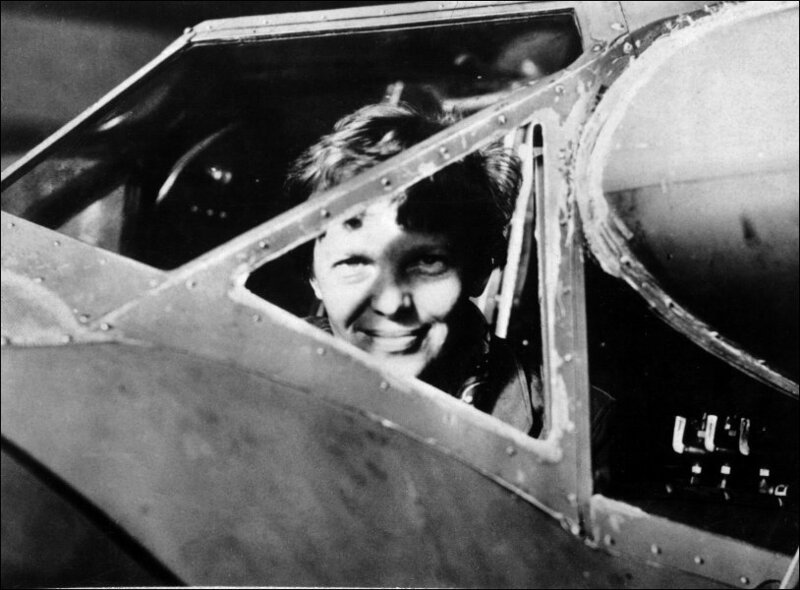 On May 15, 1923, Earhart became the 16th licensed female pilot. Earhart was aware that in the world of aviation, her image was every bit as important as her skill. If she was to be taken seriously as a pilot, she had to look the part. So she bought a leather jacket and slept in it for 3 days, to give it a worn look. And she cropped her hair short just like the other female pilots. In 1924, her parents divorced and her grandmother’s inheritance ran out. 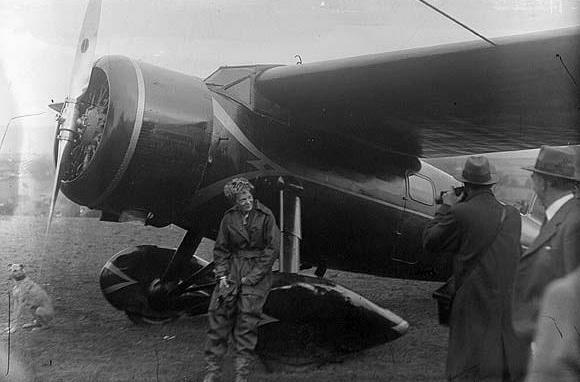 Earhart flew to Boston with her mother. She took a number of jobs and sold two of her planes to cover the cost of living. But she kept her interest in aviation alive. 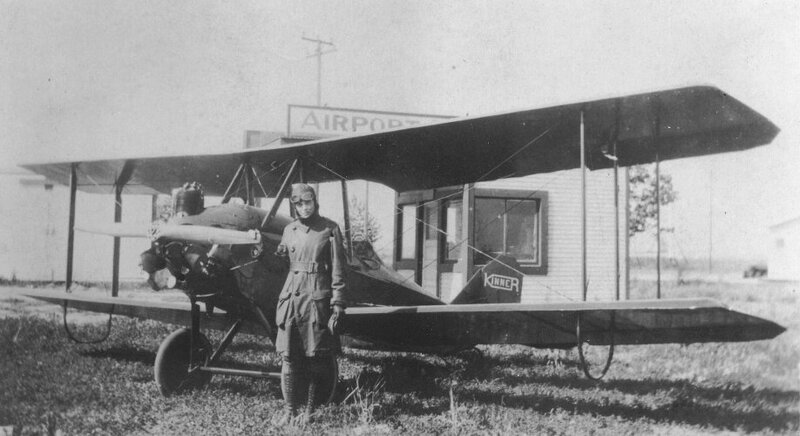 She became an early supporter of Dennison Airport and made the first official flight from there in 1927. She joined the American Aeronautical Society and quickly rose through the ranks to become the vice president. She took a job as a sales representative for Kinner Aircraft. And she took her first steps as a journalist, writing a column for the local newspapers. And so she slowly became famous, at least in Massachusetts. It was around this time that Charles Lindbergh made his historic transatlantic flight. The public interest in aviation exploded, and it was a prime time for Amelia to step into the limelight. In April 1928, Capt. Hilton H. Railey called Earhart with a question. Would she be interested in making a transatlantic flight? Amelia’s answered without hesitation – of course she would! For her first flight across the Atlantic, Earhart would be a passenger. Wilmer Stultz would pilot the plane. Amelia would be responsible for keeping the log, but for the most part, she would sit and watch the clouds go by. She described the experience as being “cargo” and felt like a sack of potatoes. Be that as it may, when the team touched down in Southampton, England, they all became instant celebrities. With newspapers calling her “The Queen of the Skies,” Amelia was quick to capitalize on her new fame. Together with her publicist George P. Putnam (who she would later marry), Earhart organized a whirlwind lecture tour. Putnam also arranged the publication of her first book “20 Hrs., 40 Min”. She also endorsed a line of clothing, luggage, and Lucky Strikes cigarettes. This blizzard of marketing did much to secure her fame and brought in a small fortune. Earhart also helped to fuel the public demand for aviation. She represented Transcontinental Air Transport together with Charles Lindbergh. Amelia had achieved fame as the first woman to fly across the Atlantic as a passenger. Now she was keen to make a name for herself as a pilot. She started by setting a record as the first woman to fly solo across North America. Then she took to the air races, starting with the Women’s Air Derby. The race ran from Santa Monica to Cleveland and was nicknamed the “Powder Puff Derby”. In 1930, she gained an appointment as an official of the National Aeronautic Association. From this position, she campaigned for greater recognition for female pilots. The result was the establishment of separate records for women. 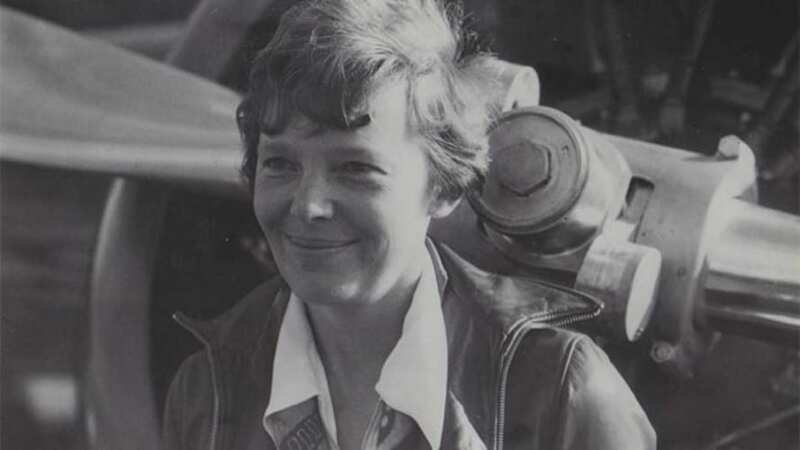 Representing the interests of female pilots was an important issue for Earhart. She joined the Ninety-Nines, an organization of female pilots. The group provides mutual support and professional opportunities to its members. It started small but has since grown to operate across the globe. When the Bendix Trophy blocked female pilots from participating, she boycotted the event. When they asked her to fly an actress to the opening ceremony, she refused. While Earhart’s competitive flying kept her reputation alive, she knew that distance flying was her strong suit. She had captured the public’s attention with the cross-Atlantic flight. She knew she would have to make the trip again – but this time, she would be the pilot. Setting off from Harbour Grace in Newfoundland, Amelia intended to fly her single engine Lockheed Vega 5B all the way to Paris. Her ambition was to recreate Lindbergh’s feat. She carried a copy of the Telegraph-Journal to prove the date of her flight (May 20, 1932). Along the way, a number of adverse conditions would cause her to change her plans. First, came the icy weather and strong northerly winds. Then her plane also started to develop mechanical problems. As she reached Ireland, she decided to end her flight there. And so she landed in a field in Culmore, north of Derry. Her flight had lasted a little under 15 hours. Nobody was expecting her to land there, so there were only a few witnesses. One farm hand asked her if she had flown far. He was rather shocked when she told him she’d flown all the way from America! She had set an “untarnished” record of her own. But she wasn’t done. Over the next few years, she would set several more records for distance flying. She would fly from Los Angeles to Mexico City, and from Hawaii to California. She set records for speed, altitude and distance. And she also set records for speed, distance, and altitude flying gyrocopters. By 1937, she was tiring of distance flying. She wanted to make one last flight, to end her long-distance career on a high note. The round-the-world challenge seemed an obvious choice. Amelia Earhart would not be the first pilot to fly around the world. That record had been set before. Once by Hugo Eckener in a dirigible – the Graf Zeppelin in 1929. And again by Wiley Post in a Lockheed Vega. Since she couldn’t be first, she decided to take the longest route, at 29,000 miles. So, What Happened to Amelia Earhart? Since her disappearance, innumerable theories have been voiced about what happened to Amelia Earhart. Maybe she was sent on a secret spy mission against the Japanese by Roosevelt. Maybe the pressure of public life forced her to fake her own death and assume a new identity. There is some evidence to support the theory that she landed on Nikumaroro (which was called Gardner Island at the time). But the evidence is far from conclusive. What we do know is that Earhart left a lasting legacy all who fly to this day. She will forever be counted among the shining stars of aviation. These men and women captured the public imagination and made commercial flight a reality. She was a very real inspiration to the 1,000 volunteers who formed the Women Airforce Service Pilots. These brave women undertook risky (often fatal) domestic flying missions during wartime. This, in turn, freed airforce pilots from routine work. The WASPs sacrifices helped to balance the airpower in the allies favor in Europe and the Pacific. Dozens of books, films and songs have featured Amelia. Even now, almost 70 years after her disappearance, people are trying to piece together the mystery of her life and her last flight. Throughout her life, Amelia Earhart refused to compromise. Although she had achieved fame and success, she demanded more of herself. She pushed herself to the limits of her ability and endurance. And, in the end, she pushed beyond those limits. One day, she paid the ultimate price. When she left the Earth for the last time, she vanished over the horizon and into history. She was lost but never forgotten.